If you're keeping fasts (vrat) during the Navratras, then this is the perfect meal for you. 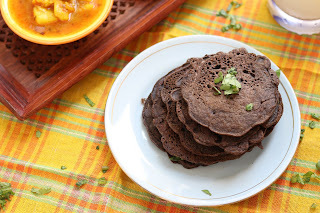 Kuttu atta ka cheela is most nutritious and filling meal you can prepare during Navratri days. 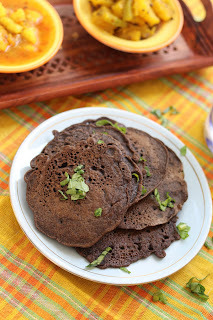 One can even have these if you are on gluten free diet, as Kuttu atta is gluten free. 1. Add all ingredients except radish in a bowl and prepare a thin batter using water. Allow the batter to rest for 10-15 min for fermentation. 2. Then add grated radish and chopped radish leaves. Mix well. 3. Pour 2 ladder full of batter on heated and greased tawa/girdle. Do not flatten the batter too much. Cook the pancakes on medium flame as kuttu atta takes more time to cook. 4. Cook till both sides becomes crisp. Serve hot with potato vegetable or pumpkin vegetable.